LITITZ – In many ways, all the hard work, all the long practices, all the weight room reps were performed with this stage in mind. 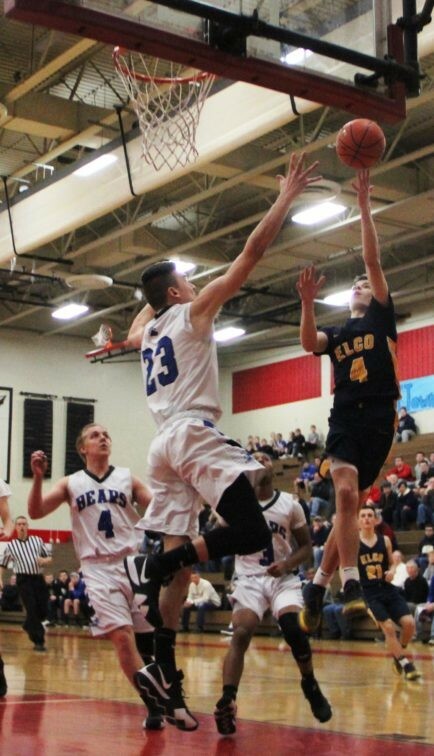 Now the Elco boys’ basketball team is down to a final shot. 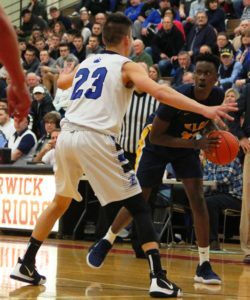 On Friday evening at Warwick High School, the Raiders endured a disappointing 64-48 defeat at the hands of Elizabethtown, in a play-in game to the Lancaster-Lebanon League playoffs. 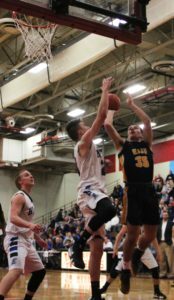 Abondoned by its bread-and-butter man-to-man defense, the Raiders were done in by a late first-half rally, then couldn’t mount a charge during the second 16 minutes of action. 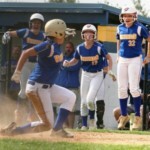 The loss droppepd Elco, the runner-up from Section Four, to 13-10 overall. 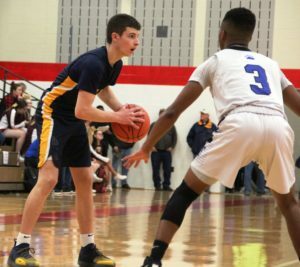 The Raiders will likely enter the upcoming PIAA District Three Class AAAA postseason as the sixth seed. Elizabethtown, the second-place finisher out of Section Two, advanced to Monday’s L-L league quarterfinals with a 14-9 mark. 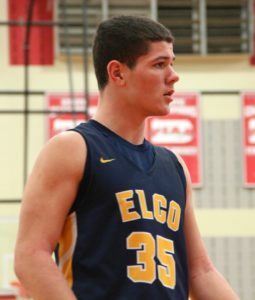 “We’re year-round,” said Elco head coach Brad Conners. 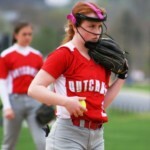 “After the end of our season, in a month we’re back at it. They (his players) do the work. They want to get better. This was big for a lot of these guys. This tournament’s special. It’s fun. You can feel the excitement. Things weren’t all bad all night for the Raiders. 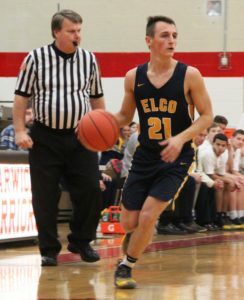 Elco came out with a spring in its step and opened a 10-4 lead midway through the opening period on back-to-back three-pointers from Braden Bohannon and Bryce Coletti. 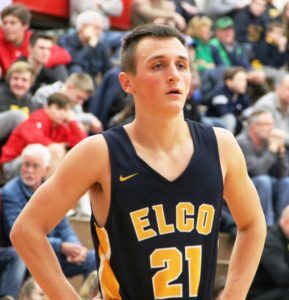 Elco led 20-15 three minutes into the second period on a Ben Horst lay-in, and 23-21 on an Evan Huey three-pointer. 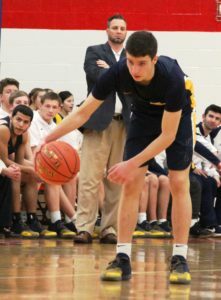 But the Raiders went without a score over the next three minutes, and Elizabethtown rattled off ten unanswered points to take a 31-23 lead it would never relinquish. “They ended the quarter strong,” said Conners of the Bears. “And we limped into the half. 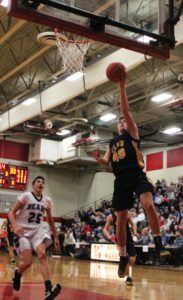 Bohannon and Asher Kemble led the Raiders with a dozen points apiece, while Coletti contrbuted ten. 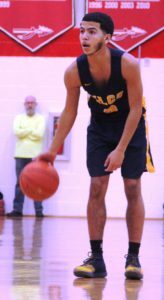 But Elco had no anwer for E-town stud Larry Locker, an athletic inside guy who poured in a game-high 24 points, including the Bears’ first ten points of the game. Elizabethtown also drained nine three-point field goals. The Raiders are giving up, on average, about 48 points per outing this season. “We were looking to stop Locker, but we really didn’t do that,” said Conners. “We also gave up all those ‘threes’, and this is what you get. I hadn’t seen it (defensive breakdowns) all year. That was a little bit surprising and a little disappointing. 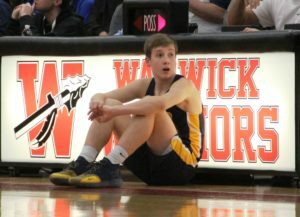 Elco’s anticipated second-half run never came. 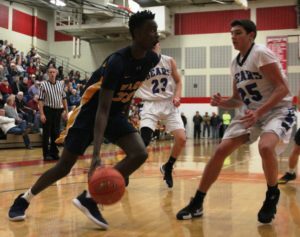 Elco went another five minutes without points in the third quarter, and the Bears pushed their advantage to 43-28. 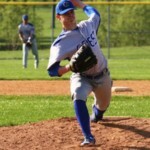 “We felt like we could do some things,” said Conners of the league playoffs. “We felt like we hadn’t played our best basketball yet. 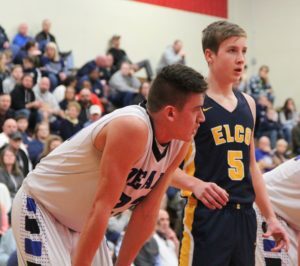 If the outcome was still in doubt, Elizabethtown settled it early in the final quarter. The Bears hit the Raiders with another 8-0 spurt to run their lead to 55-35, with six minutes remaining.